Please click the link below to learn more about the PVMS Diamonds Discount Book. There are 54 discounts to choose from. Order your Discount Book today and start saving! Recently PVMS Art Club students participated in a contest offered by PENNDOT. Each of the Monroe County school districts were given a snow plow to design. Now PENNDOT is looking for “fan favorites”. PVMS won the “fan favorite” plow. Students in Mrs. Markowski’s WIN class read about the origin of Mac ‘n’ Cheese as it relates to what was happening in the world. Students were eager to share their knowledge about the Great Depression, which is when Kraft Foods introduced their product. Students read graphs and timelines to solve problems related to Mac ‘n’ Cheese. 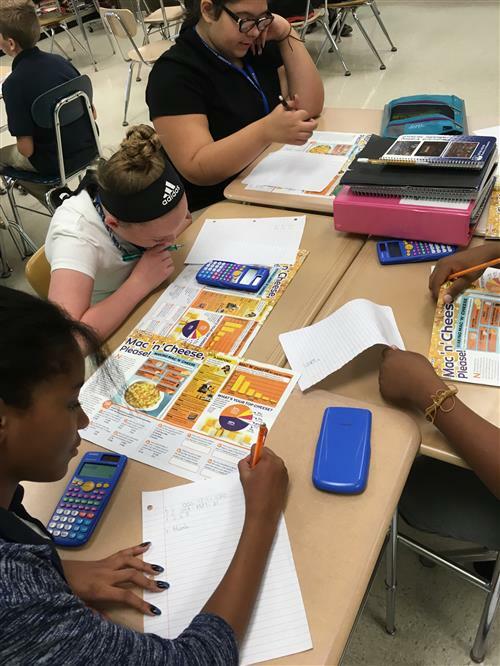 Students in Mrs. Markowski’s math class worked together to classify tables, equations, graphs, and word situations as proportional or non-proportional relationships. Students worked together to justify their reasoning and summarize the patterns they discovered.